Spreading approximately 155 square miles over Sub Carpathian Hills, the renowned Dealu Mare region is the most compact wine producing region in Romania. Dealu Mare (or Big Hill) has long been considered the original birthplace of the red wines of exceptional quality. 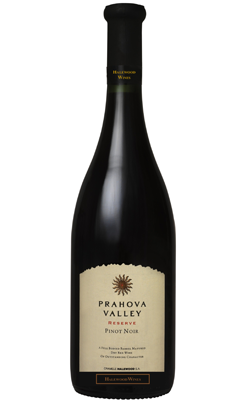 This classic variety, Pinot Noir has thrived in the lime rich soils of the Dealu Mare region for centuries. The typical warm, dry microclimate and the rather long autumns favour rich grape crops of good quality. There is a long vegetation time of 210-240 days with a maximum humidity of 55-80%. Soils rich in ferric oxides are particularly suitable for varieties such as Pinot Noir, Cabernet Sauvignon, Merlot and Feteasca Neagra. Delicate and bright ruby red. Ripe red fruits (strawberries and raspberries) with subtle notes of spices and touches of toasted French oak. Fruit-forward, fresh and flavourful, medium-bodied and fully textured in mouth; balanced acidity and a pleasant, long and persistent finish. Ideal with red meat, salmon, pasta in meat sauce and cheese.